Japanese pilgrims bearing 30,000 paper cranes visit WWII internment site, meet up with Austin Sanctuary Movement. Japanese-American Memorial Pilgrimage to Crystal City. Photo by Kimiko Marr / The Rag Blog. AUSTIN — It has been over two years since I wrote about immigrant detention. The French have an expression, “The more things change, the more they stay the same.” I just reviewed the Rag Blog posts I wrote in 2015 and 2016 and comparing them to the situation today feels masochistic. Agent Orange’s anti-immigrant vitriol has been so often repeated (and re-tweeted) that even if one has a psychic barrier to protect one from Fox Not News, the cruelty creeps under the door like some 21st century mustard gas. And we are still in the trenches. This Monday I made the drive north on Cameron, which then became Dessau and turned West on Wells Branch to visit St. Andrew’s Presbyterian Church, where my friends Hilda and Ivan have been living in Sanctuary for too long. I’m glad I made the drive because I met an extraordinary group of people who had come to Texas to make a pilgrimage to Crystal City, Texas, one of the U.S. Department of Justice internment camps that held Japanese-Americans during World War II and even after the war had ended. 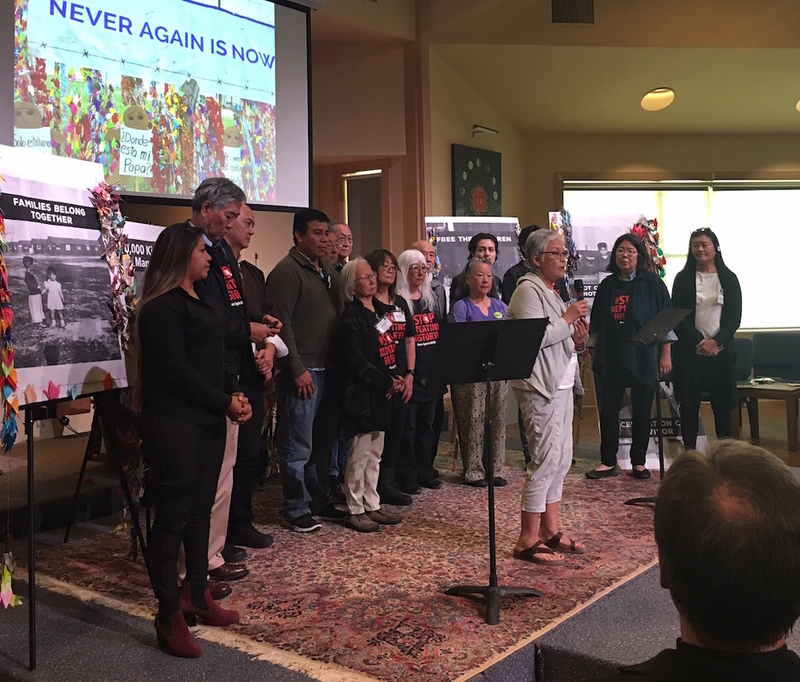 The members of this pilgrimage included adults who had been small children in the internment camps and younger people whose grandparents and other relations were in Crystal City or one of the other camps in desolate areas of the Western U.S. They came to St. Andrew’s after staging a peaceful protest at the South Texas Family Residential Center (sic) in Dilley, Texas – to meet Hilda and Ivan and members of the Austin Sanctuary Network (ASN). They came to express their memories of dislocation, separation, humiliation, and resilience. They came to express their authentic empathy to the families and children being held in detention centers in the latest iteration of Usian racist anti-immigrant policies. The large, open Sanctuary of St. Andrew’s became a place of stories, of new friendships, and a Solidarity that spanned decades, languages, and what it means to be fully human. As some had to leave to catch planes back to their homes on the West Coast and others continued to talk to the press and members of ASN, Hilda and Ivan were seated in the foyer of the church, making the cranes. A few members of the group had created a step-by-step map for them to be able to make these beautiful creatures. The immigrant justice movement in the U.S. has often used the butterfly as a symbol of transformation and freedom. Perhaps now that Hilda and Ivan know how to fold paper cranes, they will teach others. There is a possibility of a cultural exchange based on shared experience, compassion, and a fierce determination to end detention. Our new friends want to come back in November. I, for one, sincerely hope they will. Let’s ask Hilda and Ivan to teach us how to make these birds that carry freedom, beauty, and peace so that when these real allies return, we will be able to greet them with thousands of tsuru to express our appreciation that they recognize the contemporary struggle for immigrant justice as a continuation of their own stories. This entry was posted in RagBlog and tagged Elaine J. Cohen, Immigrant Detention, Japanese Pilgrimage, Rag Bloggers. Bookmark the permalink.